If an emerging growth company, indicate by check mark if the registrant has elected not to use the extended transition period for complying with any new or revised financial accounting standards provided pursuant to Section 13(a) of the Act. The aggregate market value of the voting common equity held by non-affiliates of the registrant was approximately $7,533,791,379 at June 30, 2017. Information required by Items 10-14 of Part III of this Form 10-K will be incorporated by reference to Westar Energy, Inc.’s definitive proxy statement with respect to its 2018 Annual Meeting of Shareholders, if such definitive proxy statement is filed with the Securities and Exchange Commission on or before April 30, 2018. Due to the pending merger with Great Plains Energy Incorporated, we may not be required to file a definitive proxy statement, in which case we will file an amendment to this Form 10-K on or before April 30, 2018 to include the information that is otherwise incorporated by reference. the overall economy of our service area and its impact on our customers’ demand for electricity and their ability to pay for service. other factors discussed elsewhere in this report, including in “Item 1A. Risk Factors” and “Item 7. Management’s Discussion and Analysis of Financial Condition and Results of Operations,” and in other reports we file from time to time with the Securities and Exchange Commission (SEC). These lists are not all-inclusive because it is not possible to predict all factors. This report should be read in its entirety and in conjunction with the other reports we file from time to time with the SEC. No one section of this report deals with all aspects of the subject matter and additional information on some matters that could impact our consolidated financial results may be included in the other reports we file from time to time with the SEC. The reader should not place undue reliance on any forward-looking statement, as forward-looking statements speak only as of the date such statements were made. We undertake no obligation to update any forward-looking statement to reflect events or circumstances after the date on which such statement was made. We are the largest electric utility in Kansas. Unless the context otherwise indicates, all references in this Annual Report on Form 10-K to “the Company,” “we,” “us,” “our” and similar words are to Westar Energy, Inc. and its consolidated subsidiaries. The term “Westar Energy” refers to Westar Energy, Inc., a Kansas corporation incorporated in 1924, alone and not together with its consolidated subsidiaries. We provide electric generation, transmission and distribution services to approximately 708,000 customers in Kansas. Westar Energy provides these services in central and northeastern Kansas, including the cities of Topeka, Lawrence, Manhattan, Salina and Hutchinson. Kansas Gas and Electric Company (KGE), Westar Energy’s wholly-owned subsidiary, provides these services in south-central and southeastern Kansas, including the city of Wichita. Both Westar Energy and KGE conduct business using the name Westar Energy. Our corporate headquarters is located at 818 South Kansas Avenue, Topeka, Kansas 66612. We expect to continue operating as a vertically integrated, regulated electric utility. Significant elements of our strategy include maintaining a flexible, clean and diverse energy supply portfolio. In doing so, we continue to expand renewable generation, build and upgrade our energy infrastructure and develop systems and programs with regard to how our customers use energy and interact with us. In addition, we entered into an amended and restated agreement and plan of merger with Great Plains Energy that provides for a merger of equals between the two companies. The closing of the merger is subject to customary closing conditions, including receipt of regulatory approvals. See “Item 1A. Risk Factors” and Note 3 of the Notes to Consolidated Financial Statements, “Pending Merger,” for additional information. As noted above, we supply electric energy at retail to customers in Kansas. We also supply electric energy at wholesale to municipalities and electric cooperatives in Kansas, and have contracts for the sale or purchase of wholesale electricity with other utilities. Following is the percentage of our revenues by customer classification. Classification of customers as residential, commercial and industrial requires judgment and our classifications may be different from other companies. Assignment of tariffs is not dependent on classification. We have 6,602 megawatts (MW) of generating capability in service. Further, we purchase electricity pursuant to long-term contracts from renewable generation facilities with an installed design capacity of 1,232 MW. See “Item 2. Properties” for additional information about our generating units. Our generating capability and net generation by source as of December 31, 2017, are summarized below. Due to the intermittent nature of wind generation, 230 MW of net accredited generating capacity is associated with our wind generation facilities. In 2017, we generated or purchased the equivalent of 58% of our total retail sales from emission-free resources. These resources also made up 40% of our total net generation. In March 2017, we completed construction and placed into operation Western Plains Wind Farm, a wind generating facility with a designed installed capability of 281 MW. Our aggregate 2017 peak system net load of 5,242 MW occurred in July 2017. Our net accredited generating capacity, combined with firm capacity purchases and sales and potentially interruptible load, provided a reserve margin of 17% above system peak responsibility at the time of our 2017 peak system net load, which satisfied Southwest Power Pool, Inc. (SPP) planning requirements. Under wholesale agreements, we provide firm generating capacity to other entities as set forth below. Under a wholesale agreement that expires in May 2039, we provide base load capacity to the city of McPherson, Kansas, and in return the city provides peaking capacity to us. During 2017, we provided approximately 95 MW to, and received approximately 144 MW from, the city. The amount of base load capacity provided to the city is based on a fixed percentage of its annual peak system load. The city is a full requirements customer of Westar Energy. The agreement for the city to provide capacity to us is treated as a capital lease. The effectiveness of a fuel to produce heat is measured in British thermal units (Btu). The higher the Btu content of a fuel, the smaller the volume of fuel that is required to produce a given amount of electricity. We measure the quantity of heat consumed during the generation of electricity in millions of British thermal units (MMBtu). The table below provides our weighted average cost of fuel, including transportation costs. Our wind production, which produced 22% of our total generation, has no associated fuel costs and is, therefore, not included in the table above. Jeffrey Energy Center (JEC): The three coal-fired units at JEC have an aggregate capacity of 2,175 MW, of which we own or lease a combined 92% share, or 2,001 MW. We have a long-term coal supply contract with Blackjewel Marketing and Sales, LLC to supply coal to JEC from surface mines located in the Powder River Basin (PRB) in Wyoming. The contract contains a schedule of minimum annual MMBtu quantities or assesses a charge to the extent the minimum quantities are not achieved. All of the coal used at JEC is purchased under this contract, which expires December 31, 2020. The contract provides for price escalation based on certain costs of production. The price for quantities purchased in excess of the scheduled annual minimum is subject to redetermination every five years to provide an adjusted price for the ensuing five years that reflects the market prices at the time of redetermination. The most recent price adjustment was effective January 1, 2018. The BNSF Railway Company (BNSF) and Union Pacific Railroad Company transport coal to JEC under long-term rail transportation contracts. The terms of these contracts continue through December 31, 2020, at which time we plan to enter into new contracts. These contracts provide for minimum annual deliveries or assess a charge to the extent the minimum deliveries are not achieved. The contract price in each contract is subject to price escalation based on certain costs incurred by the railroads. La Cygne Generating Station (La Cygne): The two coal-fired units at La Cygne have an aggregate generating capacity of 1,398 MW. Our share of the units is 50%, or 699 MW, of which we either own directly or consolidate through a variable interest entity (VIE). La Cygne uses primarily PRB coal but one of the two units also uses a small portion of locally-mined coal. The operator of La Cygne, Kansas City Power & Light Company (KCPL), arranges coal purchases and transportation services for La Cygne. Approximately 90% of La Cygne’s PRB coal requirements are under contract for 2018. About 80% of those commitments under contract are fixed price for 2018. As the PRB coal contracts expire, we anticipate that KCPL will negotiate new supply contracts or purchase coal on the spot market. All of the La Cygne PRB coal is transported under KCPL’s rail transportation agreements with BNSF through 2018 and Kansas City Southern Railroad through 2020. These contracts provide for minimum annual deliveries or assess a charge to the extent the minimum deliveries are not achieved. Lawrence and Tecumseh Energy Centers: Lawrence and Tecumseh Energy Centers have an aggregate generating capacity of 550 MW. We purchase PRB coal for these energy centers under a contract with Arch Coal, Inc. that provides for 100% of the coal requirements for these facilities through 2019. The contract provides for minimum annual deliveries or assesses a charge to the extent the minimum deliveries are not achieved. BNSF transports coal for these energy centers under a contract that expires in December 2020. We maintain a natural gas transportation arrangement for Hutchinson Energy Center with Kansas Gas Service. The agreement has historically expired on April 30 of each year and is renegotiated for an additional one-year term. We meet a portion of our natural gas transportation requirements for Gordon Evans, Murray Gill, Lawrence, Tecumseh and Emporia Energy Centers through firm natural gas transportation capacity agreements with Southern Star Central Gas Pipeline (SSCGP). We meet all of the natural gas transportation requirements for the State Line facility through a firm transportation agreement with SSCGP. The firm transportation agreement that serves Gordon Evans and Murray Gill Energy Centers expires in April 2020, and the agreement for Lawrence and Tecumseh Energy Centers expires in April 2030. The agreement for the State Line facility extends through October 2022, while the agreement for Emporia Energy Center is in place until December 2028, and is renewable for five-year terms thereafter. We meet all of the natural gas transportation requirements for Spring Creek Energy Center through an interruptible month-to-month transportation agreement with ONEOK Gas Transportation, LLC. We use diesel to start some of our coal generating stations, as a primary fuel in the Hutchinson No. 4 combustion turbine and in our diesel generators. We purchase No. 2 diesel in the spot market. We maintain quantities in inventory that we believe will allow us to facilitate economic dispatch of power and satisfy emergency requirements. We do not use significant amounts of diesel in our operations. Wolf Creek is a 1,174 MW nuclear power plant located near Burlington, Kansas. KGE owns a 47% interest in Wolf Creek, or 552 MW. Wolf Creek’s operating license, issued by the NRC, is effective until 2045. Wolf Creek Nuclear Operating Corporation, an operating company owned by each of the plant’s owners in proportion to their ownership share of the plant, operates the plant. The plant’s owners pay operating costs proportionate to their respective ownership share. Wolf Creek has on hand or under contract all of the uranium and conversion services needed to operate through March 2027. The owners also have under contract all of the uranium enrichment and all of the fabrication services required to operate Wolf Creek through March 2027 and September 2025, respectively. All such agreements have been entered into in the ordinary course of business. Plant performance, including extended or unscheduled shutdowns of Wolf Creek, could cause us to purchase replacement power, rely more heavily on our other generating units and/or reduce amounts of power available for us to sell in the wholesale market. Plant performance also affects the degree of regulatory oversight and related costs. Wolf Creek normally operates on an 18-month planned refueling and maintenance outage schedule. As authorized by our regulators, incremental maintenance costs of planned refueling and maintenance outages are deferred and amortized ratably over the period between planned refueling and maintenance outages. In the fall of 2016, Wolf Creek underwent a planned refueling and maintenance outage. Our share of the outage costs was approximately $24.2 million. In early 2018, Wolf Creek will undergo a planned maintenance outage. We expect our share of the outage to be approximately $21.8 million. The NRC evaluates, monitors and rates various inspection findings and performance indicators for Wolf Creek based on safety significance. Although not expected, the NRC could impose an unscheduled plant shutdown due to security or safety concerns. Those concerns need not be related to Wolf Creek specifically, but could be due to concerns about nuclear power generally or circumstances at other nuclear plants in which we have no ownership. See Note 14 of the Notes to Consolidated Financial Statements, “Commitments and Contingencies,” and “Item 1A. Risk Factors,” for additional information regarding our nuclear operations. Wind is our primary source of renewable energy. As of December 31, 2017, we owned approximately 430 MW of designed installed wind capability and had under contract the purchase of wind energy produced from approximately 1,225 MW of designed installed wind capability. In March 2017, we placed Western Plains Wind Farm into service, a wind generating facility with a designed installed capability of 281 MW. In addition to generating electricity, we also purchase power. Factors that cause us to purchase power include contractual arrangements, planned and unscheduled outages at our generating plants, favorable wholesale energy prices compared to our costs of production, weather conditions and other factors. In 2017, purchased power comprised approximately 32% of our total fuel and purchased power expense. Our weighted average cost of purchased power per Megawatt hour (MWh) was $23.01 in 2017, $24.82 in 2016 and $27.28 in 2015. The Federal Energy Regulatory Commission (FERC) requires owners of regulated transmission assets to allow third parties non-discriminatory access to their transmission systems. We are a member of the SPP RTO and transferred the functional control of our transmission system, including the approval of transmission service, to the SPP. The SPP coordinates the operation of our transmission system within an interconnected transmission system that covers all or portions of 14 states. The SPP collects revenues for the use of each transmission owner’s transmission system. Transmission customers transmit power purchased and generated for sale or bought for resale in the wholesale market throughout the entire SPP system. Transmission capacity is sold on a first come/first served non-discriminatory basis. All transmission customers are charged prices applicable to the transmission system in the zone where energy is delivered, including transmission customers that may sell power inside our certificated service territory. The SPP then distributes as revenue to transmission owners the amounts it collects from transmission users less an amount it retains to cover administrative expenses. We participate in the SPP Integrated Marketplace (IM), which is similar to organized power markets currently operating in other RTOs. The IM impacts how we commit and sell the output from our generation facilities and buy power to meet the needs of our customers. The SPP has the authority to start and stop generating units participating in the market and selects the lowest cost resource mix to meet the needs of the various SPP customers while ensuring reliable operations of the transmission system. We own a 50% interest in Prairie Wind Transmission, LLC (Prairie Wind), which is a joint venture between us and Electric Transmission America, LLC, which itself is a joint venture between affiliates of American Electric Power Company, Inc. and Berkshire Hathaway Energy Company. In 2014, Prairie Wind completed construction on, and energized, a 108-mile 345 kV double-circuit transmission line that is now being used to provide transmission service in the SPP. We continue to evaluate and participate in transmission planning activities in accordance with FERC Order No. 1000, which revised FERC’s process for planning enhancements and expansions of the electric transmission grid and the corresponding process for allocating costs thereof, in areas we believe it makes sense to do so. We believe we have opportunities to develop transmission infrastructure, including projects pursuant to which we, as the incumbent, have a right of first refusal and those projects that are subject to the Order No. 1000 competitive processes. However, we currently have no investments associated with Order No. 1000 in our forecasted capital expenditure table, and the merger will change the manner and extent to which we continue to participate in the Order No. 1000 process. Kansas law gives the Kansas Corporation Commission (KCC) general regulatory authority over our retail prices, extensions and abandonments of service and facilities, the classification of accounts, the issuance of some securities and various other matters. We are also subject to the jurisdiction of FERC, which has authority over wholesale electricity sales, including prices, the transmission of electric power and the issuance of some securities. We are subject to the jurisdiction of the NRC for nuclear plant operations and safety. Regulatory authorities have established various methods permitting adjustments to our prices for the recovery of costs. For portions of our cost of service, regulators allow us to adjust our prices periodically through the application of a formula that tracks changes in our costs, which reduces the time between making expenditures or investments and reflecting them in the prices we charge customers. However, for the remaining portions of our cost of service, we must file a general rate review, which lengthens the period of time between when we make and recover expenditures and a return on our investments. See Note 4 of the Notes to Consolidated Financial Statements, “Rate Matters and Regulation,” for information regarding our rate proceedings with the KCC and FERC. We are subject to various federal, state and local environmental laws and regulations. Environmental laws and regulations affecting our operations are overlapping, complex, subject to changes, have become more stringent over time and are expensive to implement. Such laws and regulations relate primarily to air quality, water quality, the use of water and the handling, disposal and clean-up of hazardous and non-hazardous substances and wastes, including coal combustion residuals (CCRs). These laws and regulations oftentimes require a lengthy and complex process for obtaining licenses, permits and approvals from governmental agencies for new, existing or modified facilities. If we fail to comply with such laws, regulations and permits, or fail to obtain and maintain necessary permits, we could be fined or otherwise sanctioned by regulators, and such fines or the cost of sanctions may not be recoverable in our prices. We have incurred and will continue to incur capital and other expenditures to comply with environmental laws and regulations. See “Item 1A. Risk Factors” and Notes 4 and 14 of the Notes to Consolidated Financial Statements, “Rate Matters and Regulation - KCC Proceedings - Environmental Costs” and “Commitments and Contingencies - Environmental Matters,” respectively, for more information regarding environmental trends, risks and laws and regulations. The safety and health of our employees is vital to our business. We are subject to a number of federal and state laws and regulations, including the Occupational Safety and Health Act of 1970. We have measures in place to promote the safety and health of our employees and to monitor our compliance with such laws and regulations. We rely upon information technology networks and systems to process, transmit and store electronic information, and to manage or support a variety of business processes and activities, including the generation, transmission and distribution of electricity, supply chain functions and the invoicing and collection of payments from our customers. These networks and systems are in some cases owned or managed by third-party service providers. Cybersecurity breaches, criminal activity, terrorist attacks and other disruptions to our information technology infrastructure, including infrastructure owned by third-parties we utilize, could interfere with our operations, could expose us or our customers or employees to a risk of loss and could expose us to liability or regulatory penalties or cause us reputational damage or other harm to our business. We have taken measures to secure our network and systems, but such measures may not be sufficient, especially due to the increasing sophistication of cyberattacks. See “Item 1A. Risk Factors” for additional information. Our electricity sales and revenues are seasonal, with the third quarter typically accounting for the greatest of each. Our electricity sales are impacted by weather conditions, the economy of our service territory and other factors affecting customers’ demand for electricity. As of February 14, 2018, we had 2,205 employees, 1,117 of which were covered by a contract with Locals 304 and 1523 of the International Brotherhood of Electrical Workers that extends through June 30, 2018. Our Annual Reports on Form 10-K, Quarterly Reports on Form 10-Q and Current Reports on Form 8-K are available free of charge either on our Internet website at www.westarenergy.com or through requests addressed to our investor relations department. These reports are available as soon as reasonably practicable after such material is electronically filed with, or furnished to, the SEC. The information contained on our Internet website is not part of this document. Executive officers serve at the pleasure of the board of directors. There are no family relationships among any of the executive officers, nor any arrangements or understandings between any executive officer and other persons pursuant to which he was appointed as an executive officer. We operate in market and regulatory environments that involve significant risks, many of which are beyond our control. In addition to other information in this Form 10-K, including “Item 1. Business” and “Item 7. Management’s Discussion and Analysis of Financial Condition and Results of Operations,” and in other documents we file with the SEC from time to time, the following factors may affect our results of operations, our cash flows and the value of our equity and debt securities. These factors may cause results to differ materially from those expressed in any forward-looking statements made by us or on our behalf. The factors listed below are not intended to be an exhaustive discussion of all such risks, and the statements below must be read together with factors discussed elsewhere in this document and in our other filings with the SEC. Weather conditions, including mild and severe weather, may adversely impact our consolidated financial results. Weather conditions directly influence the demand for electricity. Our customers use electricity for heating in winter months and cooling in summer months. Because of air conditioning demand, typically we produce our highest revenues in the third quarter. Milder temperatures reduce demand for electricity and have a corresponding impact on our revenues. Unusually mild weather in the future could adversely affect our consolidated financial results. In addition, severe weather conditions can produce storms that can inflict extensive damage to our equipment and facilities, which can require us to incur additional operating and maintenance expense and additional capital expenditures. Our prices may not always be adjusted timely or adequately to reflect these higher costs. Additionally, because many of our power plants use water for cooling, persistent or severe drought conditions could result in limited power production. High water conditions can also impair planned deliveries of fuel to our plants. Our prices are subject to regulatory review and may not prove adequate to recover our costs and provide a fair return. We must obtain from state and federal regulators the authority to establish terms and prices for our services. The KCC and, for most of our wholesale customers, FERC, use a cost-of-service approach that takes into account operating expenses, fixed obligations and recovery of and return on capital investments. Using this approach, the KCC and FERC set prices at levels calculated to recover such costs and a permitted return on investment. Except for wholesale transactions for which the price is not so regulated, and except to the extent the KCC and FERC permit us to modify our prices through the application of a formula that tracks changes in certain of our costs, our prices generally remain fixed until changed following a rate review. Further, the adjustments may be modified, limited or eliminated by regulatory or legislative actions. We may apply to change our prices or intervening parties may request that our prices be reviewed for possible adjustment. Rate proceedings through which our prices and terms of service are determined typically involve numerous parties including electricity consumers, consumer advocates and governmental entities, some of whom take positions that are adverse to us. In addition, regulators’ decisions may be appealed to the courts by us or other parties to the proceedings. These factors may lead to uncertainty and delays in obtaining or implementing changes to our prices or terms of service. There can be no assurance that our regulators will find all of our costs to have been prudently incurred. A finding that costs have been imprudently incurred can lead to disallowance of recovery for those costs. Further, the prices approved by the applicable regulatory body may not be sufficient for us to recover our costs and to provide for an adequate return on and of capital investments. We cannot predict the outcome of any rate review or the actions of our regulators. The outcome of rate proceedings, or delays in implementing price changes to reflect changes in our costs, could have a material effect on our consolidated financial results. Our costs of compliance with environmental laws and regulations, including those relating to GHG emissions, are significant, and the future costs of compliance with environmental laws and regulations could adversely impact our operations and consolidated financial results. We are subject to extensive federal, state and local environmental laws and regulations relating to air quality, water quality, the use of water, the handling, disposal and clean-up of hazardous and non-hazardous substances and wastes, natural resources and health and safety. Compliance with these legal requirements, which change frequently and have tended to become more restrictive, requires us to commit significant capital and operating resources toward permitting, emission fees, environmental monitoring, installation and operation of air and water quality control equipment and purchases of air emission allowances and/or offsets. These laws and regulations oftentimes require a lengthy and complex process for obtaining licenses, permits and approvals from governmental agencies for new, existing or modified facilities. If we fail to comply with such laws, regulations and permits, or fail to obtain and maintain necessary permits, we could be fined or otherwise sanctioned by regulators, and such fines or the cost of sanctions may not be recoverable in our prices. Costs of compliance with environmental laws and regulations or fines or penalties resulting from non-compliance, if not recovered in our prices, could adversely impact our operations and/or consolidated financial results, especially if emission and/or discharge limits are tightened, more extensive permitting requirements are imposed, additional substances become regulated or the number and types of assets we operate increases. We cannot estimate our compliance costs or any possible fines or penalties with certainty, or the degree to which such costs might be recovered in our prices, due to our inability to predict the requirements and timing of implementation of environmental rules or regulations. See “Item 1. Business - Environmental Matters,” “Item 7. Management’s Discussion and Analysis of Financial Condition and Results of Operations - Executive Summary - Current Trends and Uncertainties - Environmental Regulation” and Notes 4 and 14 of the Notes to Consolidated Financial Statements, “Rate Matters and Regulation - KCC Proceedings - Environmental Costs” and “Commitments and Contingencies - Environmental Matters,” respectively, for additional information. In addition, compliance with environmental laws and regulations could alter the manner in which we had planned to manage our assets, which in turn could require us to retire assets earlier than expected or record asset retirement obligations (AROs). In addition, we combust large amounts of fossil fuels as we produce electricity. This results in significant emissions of carbon dioxide (CO2) and other GHGs through the operation of our power plants. Federal legislation regulates the emission of GHGs and numerous states and regions have adopted programs to stabilize or reduce GHG emissions. The Environmental Protection Agency (EPA) regulates GHGs under the Clean Air Act. In October 2015, the EPA published a rule limiting CO2 emissions for new, modified and reconstructed coal and natural gas fueled electric generating units, along with a rule regulating emissions from existing power plants. In 2017, the EPA announced that it is reviewing the rules regarding new, modified, and reconstructed coal and natural gas electric generating units, and has proposed to effectively repeal the rule relating to existing power plants. See Note 14 of the Notes to Consolidated Financial Statements, “Commitments and Contingencies - Environmental Matters” for additional information. We believe rules that regulate or limit our emissions could have a material impact on our operations and consolidated financial results. Further, in the course of operating our coal generation plants, we produce CCRs, including fly ash, gypsum and bottom ash, which we must handle, recycle, process or dispose of. We historically have recycled some of our ash production, principally by selling to the aggregate industry. The EPA published a rule to regulate CCRs in April 2015, which will require additional CCR handling, processing and storage equipment and potential closure of certain ash disposal areas. We have recorded, and may need to record additional AROs, in connection with the rule. See Note 14 of the Notes to Consolidated Financial Statements, “Commitments and Contingencies - Environmental Matters” for additional information. The impact of this rule on our operations and consolidated financial results could be material. We could be subject to penalties as a result of mandatory reliability standards, which could adversely affect our consolidated financial results. As a result of the Energy Policy Act of 2005, owners and operators of the bulk power transmission system, including Westar Energy and KGE, are subject to mandatory reliability standards promulgated by the North American Electric Reliability Corporation and enforced by FERC. If we were found to be out of compliance with the mandatory reliability standards, we could be subject to sanctions, including substantial monetary penalties, which we might not be able to recover in the prices we charge our customers. This could have a material adverse effect on our consolidated financial results. Adverse economic conditions could adversely impact our operations and consolidated financial results. increase deductibles and premiums and result in more restrictive policy terms under insurance policies regarding risks we typically insure against, or make insurance claims more difficult to collect. A number of our commercial and industrial customers have geographically dispersed facilities, and localized factors, including economic conditions, governmental or other incentives and other factors that influence customer operating or capital expenses, may cause these customers to curtail or eliminate operations at facilities in our service territory and move them to other facilities with competitive advantages. In addition, unexpectedly strong economic conditions can result in increased costs and shortages. Any of the aforementioned events, and others we may not be able to identify, could have an adverse impact on our consolidated financial results. We are exposed to various risks associated with the ownership and operation of Wolf Creek, any of which could adversely impact our consolidated financial results. costs of measures associated with public safety. The NRC has authority to impose licensing and safety-related requirements for the operation of nuclear generation facilities. In the event of non-compliance, the NRC has authority to impose fines or shut down a unit, or both, depending upon its assessment of the severity of the situation, until compliance is achieved. Revised safety requirements enacted by the NRC could necessitate substantial capital expenditures at Wolf Creek. An incident at Wolf Creek could have a material impact on our consolidated financial results. Furthermore, the non-compliance of other nuclear facilities operators with applicable regulations or the occurrence of a serious nuclear incident at other facilities anywhere in the world could result in increased regulation of the industry or a retrospective premium assessment under our nuclear insurance coverage, both of which could increase Wolf Creek’s costs and impact our consolidated financial results. Such events could also result in a shutdown of Wolf Creek. In addition, Wolf Creek is reliant on a sole supplier for fuel and related services, which is currently the subject of Chapter 11 reorganization proceedings, and an extended outage of Wolf Creek could occur if the supplier is not able to perform under its contracts with Wolf Creek. Switching to another supplier could take an extended amount of time, and would require NRC approval. An extended outage at Wolf Creek could affect the amount of our Wolf Creek investment included in our prices, and could have a material impact on our consolidated financial results. Significant decisions about capital investments are based on forecasts of long-term demand for energy incorporating assumptions about multiple, uncertain factors. Our actual experience may differ significantly from our assumptions, which may adversely impact our consolidated financial results. We attempt to forecast demand to determine the timing and adequacy of our energy and energy delivery resources. Long-term forecasts involve risks because they rely on assumptions we make concerning uncertain factors including weather, technological change, environmental and other regulatory requirements, economic conditions, social pressures and the responsiveness of customers’ electricity demand to conservation measures and prices. Both actual future demand and our ability to satisfy such demand depend on these and other factors and may vary materially from our forecasts. If our experience varies from our forecasts, or if our regulators disagree with the prudence of certain of our decisions, we could be required to increase our AROs or record impairment charges, and our consolidated financial results may be adversely impacted. Our planned capital investments subject us to risks. unanticipated cost increases with respect to labor or materials, including basic commodities needed for our infrastructure such as steel, copper and aluminum. These and other factors, or any combination of them, could cause us to defer or limit our capital expenditure program and could adversely impact our consolidated financial results. Our ability to fund our capital expenditures and meet our working capital and liquidity needs may be limited by conditions in the credit and capital markets, by our credit ratings or the market price of Westar Energy’s common stock. Further, capital market conditions can cause fluctuations in the values of assets set aside for employee benefit obligations and the Wolf Creek nuclear decommissioning trust (NDT) and may increase our funding requirements related to these obligations. To fund our capital expenditures and for working capital and liquidity, we rely on internally generated cash, access to capital markets, and short-term credit. Disruption in capital markets, deterioration in the financial condition of the financial institutions on which we rely, any credit rating downgrade or any decrease in the market price of Westar Energy’s common stock may make capital more difficult and costly for us to obtain, may restrict liquidity available to us, may require us to defer or limit capital investments or impact operations or may reduce the value of our financial assets. The Tax Cuts and Jobs Act (TCJA) will reduce our internally generated cash, which might adversely impact the manner in which our credit rating is evaluated. These could adversely impact our business and consolidated financial results, including our ability to pay dividends and to make investments or undertake programs necessary to meet regulatory mandates and customer demand. Further, we have significant future financial obligations with respect to employee benefit obligations and the Wolf Creek NDT. The value of the assets needed to meet those obligations are subject to market fluctuations and will yield uncertain returns, which may fall below our expectations for meeting our obligations. Additionally, inflation and changes in interest rates impact the value of future liabilities. In general, when interest rates decline, the value of future liabilities increase. While the KCC allows us to implement a regulatory accounting mechanism to track certain of our employee benefit plan expenses, this mechanism does not allow us to make automatic price adjustments. Only in future rate proceedings may we be allowed to adjust our prices to reflect changes in our funding requirements. Further, the tracking mechanism for these benefit plan expenses is part of our overall rate structure, and as such, it is subject to KCC review and may be modified, limited or eliminated in the future. If these assets are not managed successfully, our consolidated financial results and cash flows could be adversely impacted. Physical and cybersecurity breaches, criminal activity, terrorist attacks and other disruptions to our facilities or our information technology infrastructure could interfere with our operations, expose us or our customers or employees to a risk of loss and expose us to liability or regulatory penalties or cause reputational damage and other harm to our business. We rely upon information technology networks and systems to process, transmit and store electronic information, and to manage or support a variety of business processes and activities, including the generation, transmission and distribution of electricity, supply chain functions, and the invoicing and collection of payments from our customers. We also use information technology networks and systems to record, process and summarize financial information and results of operations for internal reporting purposes and to comply with financial reporting, legal and tax requirements. These networks and systems are in some cases owned or managed by third-party service providers. In the ordinary course of business, we collect, store and transmit sensitive data including operating information, proprietary business information belonging to us and third parties and personal information belonging to our customers and employees. Our information technology networks and infrastructure, as well as the networks and infrastructure belonging to third-party service providers that we utilize, may be vulnerable to damage, disruptions or shutdowns due to attacks or breaches by hackers or other unauthorized third parties; error or malfeasance by one or more of our or our service providers’ employees; software or hardware upgrades; additions or replacements; malicious software code; telecommunication failures; natural disasters or other catastrophic events. The occurrence of any of these events could, among other things, impact the reliability or safety of our generation, transmission and distribution systems; result in the erasure of data or render our equipment unusable; impact our ability to conduct business in the ordinary course; expose us and our customers, employees and vendors to a risk of loss or misuse of information; and result in legal claims or proceedings, liability or regulatory penalties against us, damage our reputation or otherwise harm our business. We can provide no assurance that we will identify and remedy all security or system vulnerabilities or that unauthorized access or error will be identified and remedied. We are subject to laws and rules issued by multiple government agencies concerning safeguarding and maintaining the confidentiality of our security, customer and business information. For example, NERC has issued comprehensive regulations and standards surrounding the security of bulk power systems, and is continually in the process of developing updated and additional requirements with which the utility industry must comply. The NRC also has issued regulations and standards related to the protection of critical digital assets at nuclear power plants. Compliance with NERC and NRC rules and standards, and rules and standards promulgated by other regulatory agencies from time to time, will increase our compliance costs and our exposure to the potential risk of violations of these rules and standards, which includes potential financial penalties. Furthermore, the non-compliance of other utilities with applicable regulations or the occurrence of a serious security event at other utilities could result in increased regulation or oversight, both of which could increase our costs and impact our consolidated financial results. Additionally, we cannot predict the impact that any future information technology or terrorist attack may have on the energy industry in general. The electric utility industry, both within the United States and internationally, has experienced physical and cybersecurity attacks on energy infrastructure such as power plants, substations, and related assets in the past, and there may be more attacks in the future. Our facilities could be direct targets or indirect casualties of such attacks. The effects of such attacks could include disruption to our generation, transmission and distribution systems or to the electrical grid in general, and could increase the cost of insurance coverage or result in a decline in the U.S. economy. Any of the foregoing could adversely impact our operations or financial results. Equipment failures and other events beyond our control may cause extended or unplanned plant outages, which may adversely impact our consolidated financial results. The generation, distribution and transmission of electricity require the use of expensive and complicated equipment, much of which is aged, and all of which requires significant ongoing maintenance. Our power plants and equipment are subject to extended outages because of equipment failure, weather, transmission system disruption, operator error, contractor or subcontractor failure and other factors. In such events, we must either produce replacement power from our other plants, which may be less efficient or more expensive to operate, purchase power from others at unpredictable and potentially higher costs in order to meet our sales obligations, or suffer outages. Such events could also limit our ability to make sales to customers. Therefore, the occurrence of extended or unplanned outages could adversely affect our consolidated financial results. Recent comprehensive tax legislation could adversely affect our consolidated financial results and liquidity. In addition, we may not be able to fully utilize net operating loss, tax credit or other tax carryforwards, or realize expected production tax credits related to our wind farms, all of which could adversely impact our consolidated financial results and liquidity. Major tax legislation, known as the TCJA, was signed into law in December 2017. The TCJA significantly reforms the Internal Revenue Code of 1986, as amended (IRC), and is generally effective January 1, 2018. The TCJA contains significant changes to federal corporate income taxation, including, in general and among other things, reducing the federal corporate income tax rate from 35% to 21%, limiting the deduction for net operating losses, eliminating net operating loss carrybacks and eliminating our use of bonus depreciation on new capital investments. Due to the complexity of the TCJA, including any possible future legislation that amends the TCJA, the limited guidance from regulatory agencies, including the Internal Revenue Service, FERC and the KCC, and contemporaneous state dockets, including one in Kansas dedicated to the impact of the TCJA, the overall impact of the TCJA on us is uncertain, and our business, as well as the business of the combined companies following closing of the merger, could be adversely affected by the TCJA or related regulatory proceedings and actions. The TCJA will reduce our revenues and internally generated cash flows due to the reduced collection of taxes in customer prices. Due to the reasons noted above, this reduction could be more than we anticipate and could adversely affect our consolidated financial results and liquidity. In addition, the reduction in the corporate tax rate may result in a reduction of deferred income tax assets and liabilities currently recorded, and may result in one or more charges to our results of operations to the extent that the assets and liabilities are not attributable to our rate regulated business. Further, there may be other material adverse effects resulting from the legislation that we have not yet identified. Over the last several years, our income tax obligations have been reduced due to the continued use of bonus depreciation provisions that allow for an acceleration of deductions for tax purposes and IRS guidance on tax deductions for repairs. Although the TCJA expands bonus depreciation in general, it eliminates bonus depreciation for regulated utilities on new capital investments. We assess our future ability to utilize tax benefits, including those in the form of net operating loss, tax credit and other tax carryforwards, that are recorded as deferred income tax assets on our balance sheets to determine whether a valuation allowance is necessary. A reduction in, or disallowance of these tax benefits resulting from a legislative change or adverse determination by a taxing jurisdiction could have an adverse impact on our consolidated financial results and liquidity. Additionally, changes in corporate tax rates or policy changes, such as those resulting from the TCJA, as well as any inability to generate enough taxable income in the future to utilize all of our tax benefits before they expire, could have an adverse impact on our consolidated financial results and liquidity. In addition, we operate wind farms that generate production tax credits for us to use to reduce our federal income tax obligations. The amount of production tax credits we earn is dependent on the level of electricity output generated by our wind farms and the applicable tax credit rate. A variety of operating and economic parameters, including transmission constraints, adverse weather conditions and breakdown or failure of equipment, could significantly reduce the production tax credits generated by our wind farms, which could have an adverse impact on our consolidated financial results. Our regulated business model may be threatened by technological advancements that could adversely affect our financial condition and results of operations. Significant technological advancements have taken and will continue to take place in the electric industry, including advancements related to self-generation and distributed energy technologies such as fuel cells, micro turbines, wind turbines and solar cells, as well as related to the storage of energy produced by these systems. Adoption of these technologies may increase because of advancements or government subsidies reducing the cost of generating or storing electricity through these technologies to a level that is competitive with our current methods of generating electricity. There is also a perception that generating or storing electricity through these technologies is more environmentally friendly than generating electricity with fossil fuels. Increased adoption of these technologies could reduce electricity demand and the pool of customers from whom fixed costs are recovered, resulting in under recovery of our fixed costs. Increased self-generation and the related use of net energy metering, which allows self-generating customers to receive bill credits for surplus power, could put upward price pressure on our remaining customers. If we were unable to adjust our prices to reflect reduced electricity demand and increased self-generation and net energy metering, our financial condition and results of operations could be adversely affected. We cannot provide any assurance that the merger will be completed. Failure to complete the merger could negatively affect the trading price of our common stock and our future business and financial results. The closing of the merger is subject to various conditions, including, among others, (i) receipt of all required regulatory approvals from, among others, the FERC, NRC, KCC, and Public Service Commission of the State of Missouri (MPSC) (provided that such approvals do not result in a material adverse effect on Great Plains Energy or Westar Energy and their respective subsidiaries, after giving effect to the merger, measured on the size and scale of Westar Energy and its subsidiaries, taken as a whole); (ii) effectiveness of the registration statement for the shares of the new holding company common stock to be issued to Westar Energy and Great Plains Energy shareholders in the merger and approval of the listing of such shares on the New York Stock Exchange; (iii) the absence of any material adverse effect with respect to Westar Energy, Great Plains Energy and their respective subsidiaries; (iv) the absence of laws or judgments, whether preliminary, temporary or permanent, which may prevent, make illegal or prohibit the completion of the merger; (v) subject to certain materiality exceptions, the accuracy of the representations and warranties made by Westar Energy and Great Plains Energy, respectively, and compliance by Westar Energy and Great Plains Energy with their respective obligations under the amended and restated merger agreement; (vi) the receipt of tax opinions by us and Great Plains Energy that the merger will be treated as a non-taxable event for U.S. federal income tax purposes; (vii) there being no shares of Great Plains Energy preference stock outstanding; and (viii) Great Plains Energy having not less than $1.25 billion in cash or cash equivalents on its balance sheet. potential payments by us to Great Plains Energy for damages, or if the merger agreement is terminated under certain circumstances, a termination fee of $190.0 million. The merger is subject to the receipt of consent or approval from governmental entities that could delay the completion of the merger or impose conditions that could have a material adverse effect on the combined company. Completion of the merger is conditioned upon, among other things, the receipt of consents, orders, approvals or clearances, as required, from, among others, the FERC, NRC, KCC and MPSC (provided that such approvals do not result in a material adverse effect on Great Plains Energy or Westar Energy and their respective subsidiaries, after giving effect to the merger, measured on the size and scale of Westar Energy and its subsidiaries, taken as a whole). On April 19, 2017, the KCC rejected the original proposed acquisition of Westar Energy by Great Plains Energy, and we are unable to predict how the KCC will evaluate the new proposed merger. A substantial delay in obtaining satisfactory approvals or the imposition of unfavorable terms or conditions in connection with such approvals could adversely affect the business, financial condition or results of operations of us or Great Plains Energy or may result in the termination of the merger agreement. Failure to receive satisfactory approvals may also make any alternative future strategic transaction more challenging, which could in turn negatively impact the price of our common stock. For additional information on the status of various approvals in connection with the pending merger, see Notes 3 and 14 of the Notes to Consolidated Financial Statements, “Pending Merger” and “Commitments and Contingencies,” respectively. The anticipated benefits of combining the companies may not be realized. expected from the merger. In addition, we may not be able to integrate our operations with Great Plains Energy’s existing operations without encountering difficulties, including inconsistencies in standards, systems and controls, and without diverting management’s focus and resources from ordinary business activities and opportunities. Any of the foregoing could have a material adverse effect on the combined company. We will incur significant transaction and transition costs in connection with the merger. We and Great Plains Energy expect to incur significant transaction and transition costs in connection with the consummation of the merger and the subsequent integration of the companies (in addition to the costs we and Great Plains Energy have already incurred on the prior proposed acquisition of us). Prior to consummation of the merger, we may also incur additional costs to maintain employee morale and to retain key employees. Great Plains Energy will also incur significant fees and expenses in connection with unwinding financing arrangements that were implemented to finance the prior proposed acquisition of us. These expenses could reduce or eliminate the savings that we expect to achieve from the merger, and accordingly, any net benefits may not be achieved in the near term or at all. These transaction and transition expenses may result in significant charges taken against earnings by us prior to the completion of the merger and by the combined company following the completion of the merger. We will be subject to business uncertainties and contractual restrictions while the merger is pending, which could adversely affect our business. Uncertainty about the impact of the merger, including on employees and customers, may have an adverse effect on us and Great Plains Energy and, consequently, on the combined company. These uncertainties may impair our and Great Plains Energy’s ability to attract, retain and motivate personnel, and could cause customers, suppliers and others that deal with us to seek to change existing business relationships with us and/or Great Plains Energy. If employees depart, our business or the combined company’s business could be harmed. In addition, the merger agreement restricts us, without the consent of Great Plains Energy, and Great Plains Energy, without our consent, from taking specified actions until the merger is completed or the amended and restated merger agreement terminates. These restrictions may prevent us or Great Plains Energy from pursuing otherwise attractive business opportunities and making other changes to our respective businesses. Pending litigation against us and Great Plains Energy may adversely affect the combined company’s business, financial condition or results of operations following the merger. Following the announcement of the original merger agreement, a putative derivative lawsuit was filed in the District Court of Shawnee County, Kansas against the members of our board of directors, Great Plains Energy and a subsidiary of Great Plains Energy, alleging breaches of various fiduciary duties by members of our board of directors in connection with the original proposed transaction and alleging that Great Plains Energy and a subsidiary of Great Plains Energy aided and abetted such alleged breaches of fiduciary duties. The putative derivative petition was refiled in October 2017. Also following the announcement of the original merger agreement, two putative class action lawsuits (which were consolidated and superseded by a consolidated complaint) were filed in the District Court of Shawnee County, Kansas against Westar Energy, the members of our board of directors and Great Plains Energy, alleging breaches of various fiduciary duties by the members of our board of directors in connection with the proposed merger and alleging that we and Great Plains Energy aided and abetted such alleged breaches of fiduciary duties. In September 2017, the lead plaintiffs moved to amend the class action petition with allegations similar to those made regarding the original merger agreement but focusing on the revised merger. Also in September 2017, a putative class action lawsuit was filed in the United States District Court for the District of Kansas challenging the merger and alleged disclosure violations under sections 14(a) and 20(a) of the Securities Exchange Act of 1934, as amended (Exchange Act). In October 2017, another putative class action lawsuit was filed in the United States District Court for the District of Kansas. This federal class action complaint challenges the merger and alleges violations of sections 14(a) and 20(a) of the Exchange Act. On November 16, 2017, the parties in each of the actions independently agreed to withdraw requests for injunctive relief and otherwise agreed in principle to dismissing the actions with prejudice and to providing releases. In the future, the parties will prepare and present to the court for approval Stipulations of Settlement that will, if accepted by the court, settle the actions in their entirety. The outcome of litigation is inherently uncertain. The defense or settlement of any lawsuit or claim that remains unresolved at the time the merger closes may adversely affect the combined company’s business, financial condition or results of operation. See Note 16 of the Notes to Consolidated Financial Statements, “Legal Proceedings,” for additional information. (a) Capability (except for wind generating facilities) represents accredited net generating capacity approved by the SPP. Capability for our wind generating facilities represents the installed design capacity. Due to the intermittent nature of wind generation, these facilities are associated with a total of 230 MW of accredited generating capacity. (b) Westar Energy jointly owns State Line (40%) while KGE jointly owns La Cygne unit 1 (50%) and Wolf Creek (47%). We jointly own or lease 92% of JEC. Unit capacity amounts reflect our ownership and leased percentages only. We own and have in service approximately 6,400 miles of transmission lines, approximately 24,200 miles of overhead distribution lines and approximately 5,100 miles of underground distribution lines. Substantially all of our utility properties are encumbered by first priority mortgages pursuant to which bonds have been issued and are outstanding. Information on legal proceedings is set forth in Notes 4, 14 and 16 of the Notes to Consolidated Financial Statements, “Rate Matters and Regulation,” “Commitments and Contingencies” and “Legal Proceedings,” respectively, which are incorporated herein by reference. The following graph compares the performance of Westar Energy’s common stock during the period that began on December 31, 2012, and ended on December 31, 2017, to the performance of the Standard & Poor’s 500 Index (S&P 500) and the Standard & Poor’s Electric Utility Index (S&P Electric Utilities). 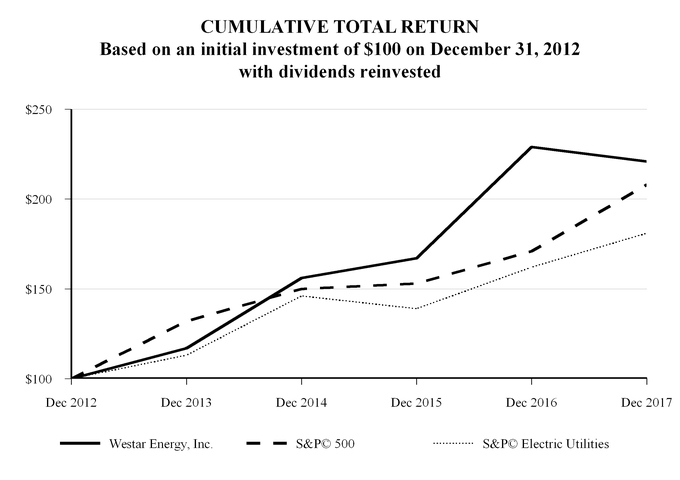 The graph assumes a $100 investment in Westar Energy’s common stock and in each of the indices at the beginning of the period and a reinvestment of dividends paid on such investments throughout the period. Holders of Westar Energy’s common stock are entitled to dividends when and as declared by Westar Energy’s board of directors. Quarterly dividends on common stock have historically been paid on or about the first business day of January, April, July and October to shareholders of record as of or about the ninth day of the preceding month. Westar Energy’s board of directors reviews the common stock dividend policy from time to time. Among the factors the board of directors considers in determining Westar Energy’s dividend policy are earnings, cash flows, capitalization ratios, regulation, competition and financial loan covenants. In 2017, Westar Energy’s board of directors declared four quarterly dividends of $0.40 per share, reflecting an annual dividend of $1.60 per share, compared to four quarterly dividends of $0.38 per share in 2016, reflecting an annual dividend of $1.52 per share. On February 21, 2018, Westar Energy’s board of directors declared a quarterly dividend of $0.40 per share payable to shareholders on April 2, 2018. The indicated annual dividend rate is $1.60 per share. The merger agreement includes certain restrictions and limitations on our ability to declare dividend payments. The merger agreement, without prior approval of Great Plains Energy, limits our quarterly dividends declared to $0.40 per share. Net income attributable to Westar Energy, Inc.
Includes long-term debt, net, current maturities of long-term debt, capital leases, long-term debt of VIEs, net and current maturities of long-term debt of VIEs. See Note 18 of the Notes to Consolidated Financial Statements, “Variable Interest Entities,” for additional information regarding VIEs. In 2015, Westar Energy issued and sold approximately 9.7 million shares of common stock realizing proceeds of $258.0 million. In 2014, Westar Energy issued and sold approximately 3.4 million shares of common stock realizing proceeds of $87.7 million. Certain matters discussed in Management’s Discussion and Analysis are “forward-looking statements.” The Private Securities Litigation Reform Act of 1995 has established that these statements qualify for safe harbors from liability. Forward-looking statements may include words like we “believe,” “anticipate,” “target,” “expect,” “estimate,” “intend” and words of similar meaning. Forward-looking statements describe our future plans, objectives, expectations or goals. See “Forward-Looking Statements” above for additional information. We are the largest electric utility in Kansas. We produce, transmit and sell electricity at retail to approximately 708,000 customers in Kansas under the regulation of the KCC. We also supply electric energy at wholesale to municipalities and electric cooperatives in Kansas under the regulation of FERC. We have contracts for the sale or purchase of wholesale electricity with other utilities. The TCJA, which was signed into law in December 2017, significantly reforms the IRC and is generally effective January 1, 2018. The TCJA contains significant changes to federal corporate income taxation, including, in general and among other things, reducing the federal corporate income tax rate from 35% to 21%, limiting the deduction for net operating losses, eliminating net operating loss carrybacks and eliminating our use of bonus depreciation on new capital investments. We were required to remeasure deferred income tax assets and liabilities at the lower 21% corporate tax rate as of the date the TCJA was signed into law. As a result, we decreased net deferred income tax liabilities by approximately $1.0 billion and made corresponding adjustments to regulatory assets and regulatory liabilities. Nearly all of the benefit of the lower corporate tax rate will lower prices for our customers over a period generally corresponding to the life of our plant assets. In addition, in 2017 we decreased non-regulated net deferred income tax assets by approximately $12.2 million and correspondingly recorded an increase in income tax expense, which increased our effective tax rate by 2.5%. Changes to income tax expense that are included in our prices occur through either rate review, by updating prices through formulas for transmission and wholesale prices or other regulatory action. We expect that future price changes for providing retail and wholesale electricity and transmission service will retroactively apply the lower 2018 income tax expense. Due to the nature of the regulatory process, and the inherent delay in our ability to adjust our prices, we may collect revenue in 2017 that is reflective of the higher corporate tax rate in effect prior to the passage of the TCJA. Therefore, we will reflect the expectation of retroactive application of lower prices in 2018 revenues and, correspondingly, we will accrue a regulatory liability representing our obligation to return these amounts to customers once the new prices are approved or otherwise take effect. We estimate that the lower prices will result in approximately $85.0 million less per year in revenues and a corresponding decrease in income tax expense. Further, we expect approximately $85.0 million less in cash receipts from customers due to less income tax included in our prices, which may require us to raise additional debt. On May 29, 2016, we entered into an agreement and plan of merger with Great Plains Energy that provided for the acquisition of Westar Energy by Great Plains Energy. On April 19, 2017, the KCC rejected the prior transaction. In July 2017, we announced that we intend to retire unit 7 at Tecumseh Energy Center, units 3 and 4 at Murray Gill Energy Center, and units 1 and 2 at Gordon Evans Energy Center in 2018, subject to the completion of the merger. The decision was based in part on lower demand for energy from the plants. The depreciable lives of the assets have been, and continue to be, based upon us operating as a stand-alone entity. Retiring these units or any other assets identified as part of integration planning could result in the retirement of assets prior to the end of their estimated useful lives or recording a loss on obsolete inventory. Following is a summary of our net income and basic earnings per share (EPS) for the years ended December 31, 2017 and 2016. Net income attributed to Westar Energy, Inc. and basic EPS for the year ended December 31, 2017, as compared to the year ended December 31, 2016, decreased due primarily to lower retail sales attributable to milder weather and recording less in corporate-owned life insurance (COLI) benefits. Partially offsetting these decreases were lower income tax expense due to lower income before income taxes. We are subject to various federal, state and local environmental laws and regulations. Environmental laws and regulations affecting our operations are overlapping, complex, subject to changes, have become more stringent over time and are expensive to implement. There are a variety of final and proposed laws and regulations that could have a material adverse effect on our operations and consolidated financial results. See Note 14 of the Notes to Consolidated Financial Statements, “Commitments and Contingencies—Environmental Matters,” for a discussion of environmental costs, laws, regulations and other contingencies. We expect AFUDC for both borrowed funds and equity funds to fluctuate based on the timing and manner in which we finance our capital expenditures. We expect a slight increase in our interest expense over the next several years as a result of our need to raise a modest amount of debt in order to fund our capital expenditure program. In addition, the passage of the TCJA will reduce cash flows we receive from our customers due to lower income taxes included in our prices. The reduction in cash flows may require us to raise additional debt resulting in higher interest expense. We believe increased interest expense will be reflected in the prices we are permitted to charge customers, as cost of capital will be a component of future rate proceedings and is also recognized in some of the other rate adjustments we are permitted to make. In addition, short-term interest rates are low by historical standards. We cannot predict to what extent these conditions will continue. See Note 10 of the Notes to Consolidated Financial Statements, “Long-Term Debt” and “Item 1A Risk Factors” for additional information regarding the issuance of long-term debt. Retail customer additions have been growing approximately 0.5% the past few years. With the numerous energy efficiency policy initiatives promulgated through federal, state and local governments, as well as industry initiatives, environmental regulations and the need to strengthen and modernize the grid, which will increase our prices, we believe customers will continue to adopt more energy efficiency and conservation measures, which will slow or possibly suppress the growth of demand for electricity. In 2018, we expect to maintain our current business strategy and regulatory approach. Assuming normal weather, we expect 2018 retail electricity sales growth will be 0.5% or less. In addition, we anticipate increased operating and maintenance and selling, general and administrative expenses. We also expect SPP transmission expense and property tax expense to continue to increase at a much higher rate than inflation. However, we believe this will have a minimal impact to our consolidated financial results since SPP transmission expense and property tax expense are offset with higher revenues pursuant to our regulatory mechanisms. We also anticipate incremental merger-related expenses. See Note 3 of the Notes to Consolidated Financial Statements, “Pending Merger,” for additional information. To help fund our capital spending as provided under “—Future Cash Requirements” below, in 2018 we may issue long-term debt, and utilize short-term borrowings by issuing commercial paper until permanent financing is in place. Our discussion and analysis of financial condition and results of operations are based on our consolidated financial statements, which have been prepared in conformity with Generally Accepted Accounting Principles (GAAP). Note 2 of the Notes to Consolidated Financial Statements, “Summary of Significant Accounting Policies,” contains a summary of our significant accounting policies, many of which require the use of estimates and assumptions by management. The policies highlighted below have an impact on our reported results that may be material due to the levels of judgment and subjectivity necessary to account for uncertain matters or their susceptibility to change. We apply accounting standards that recognize the economic effects of rate regulation. Accordingly, we have recorded regulatory assets and liabilities when required by a regulatory order or based on regulatory precedent. Regulatory assets represent incurred costs that have been deferred because they are probable of future recovery in our prices. Regulatory liabilities represent probable future reductions in revenue or refunds to customers. The deferral of costs as regulatory assets is appropriate only when the future recovery of such costs is probable. In assessing probability, we consider such factors as specific regulatory orders, regulatory precedent and the current regulatory environment. If we deem it no longer probable that we would recover such costs, we would record a charge against income in the amount of the related regulatory assets. We and Wolf Creek calculate our pension benefit and post-retirement medical benefit obligations and related costs using actuarial concepts within the guidance provided by GAAP. In accounting for our retirement plans and post-retirement benefits, we make assumptions regarding the valuation of benefit obligations and the performance of plan assets. The reported costs of our pension plans are impacted by estimates regarding earnings on plan assets, contributions to the plan, discount rates used to determine our projected benefit obligation and pension costs and employee demographics including age, life expectancy and compensation levels and employment periods. Changes in these assumptions result primarily in changes to regulatory assets, regulatory liabilities or the amount of related pension and post-retirement benefit liabilities reflected on our consolidated balance sheets. Such changes may also require cash contributions. The following table shows the impact of a 0.5% change in our pension plan discount rate, salary scale and rate of return on plan assets. Increases or decreases due to changes in actuarial assumptions result primarily in changes to regulatory assets and liabilities. The following table shows the impact of a 0.5% change in the discount rate and rate of return on plan assets and a 1% change in the annual medical trend on our post-retirement benefit plans. We record revenue at the time we deliver electricity to customers. We determine the amounts delivered to individual customers through systematic monthly readings of customer meters. At the end of each month, we estimate how much electricity we have delivered since the prior meter reading and record the corresponding unbilled revenue. Our unbilled revenue estimate is affected by factors including fluctuations in energy demand, weather, line losses and changes in the composition of customer classes. We recorded estimated unbilled revenue of $76.7 million as of December 31, 2017 and $74.4 million as of December 31, 2016. We use the asset and liability method of accounting for income taxes. Under this method, we recognize deferred income tax assets and liabilities for the future tax consequences attributable to temporary differences between the financial statement carrying amounts and the tax basis of existing assets and liabilities. We recognize future tax benefits to the extent that realization of such benefits is more likely than not. With the passage of the Tax Cuts and Jobs Act (TCJA) in December 2017, we were required to remeasure deferred income tax assets and liabilities at the lower 21% corporate tax rate and defer the amount of excess deferred taxes previously collected from our customers to a regulatory liability, the majority of which will be amortized to income over a period generally corresponding to the life of our plant assets. We amortize deferred investment tax credits over the lives of the related properties as required by tax laws and regulatory practices. We recognize production tax credits in the year that electricity is generated to the extent that realization of such benefits is more likely than not. We record deferred income tax assets to the extent capital losses, net operating losses or tax credits will be carried forward to future periods. However, when we believe based on available evidence that we do not, or will not, have sufficient future capital gains or taxable income in the appropriate taxing jurisdiction to realize the entire benefit during the applicable carryforward period, we record a valuation allowance against the deferred income tax asset. The application of income tax law is complex. Laws and regulations in this area are voluminous and often ambiguous. Accordingly, we must make judgments regarding income tax exposure. Interpretations of and guidance surrounding income tax laws and regulations change over time. As a result, changes in our judgments can materially affect amounts we recognize in our consolidated financial statements. We believe the accounting associated with the passage of the TCJA is complete and we have therefore not recorded any provisional amounts in our consolidated financial statements. See Note 11 of the Notes to Consolidated Financial Statements, “Taxes,” for additional detail on our accounting for income taxes. We have recognized legal obligations associated with the disposal of long-lived assets that result from the acquisition, construction, development or normal operation of such assets. Concurrent with the recognition of the liability, the estimated cost of the ARO is capitalized and depreciated over the remaining life of the asset. We estimate our AROs based on the fair value of the AROs we incurred at the time the related long-lived assets were either acquired, placed in service or when regulations establishing the obligation became effective. The recording of AROs for regulated operations has no income statement impact due to the deferral of the adjustments through the establishment of a regulatory asset or an offset to a regulatory liability. We initially recorded AROs at fair value for the estimated cost to decommission Wolf Creek (our 47% share), retire our wind generating facilities, dispose of asbestos insulating material at our power plants, remediate ash disposal ponds, close ash landfills and dispose of polychlorinated biphenyl contaminated oil. ARO refers to a legal obligation to perform an asset retirement activity in which the timing and/or method of settlement may be conditional on a future event that may or may not be within the control of the entity. In determining our AROs, we make assumptions regarding probable future disposal costs. A change in these assumptions could have a significant impact on the AROs reflected on our consolidated balance sheets. We and our subsidiaries are involved in various legal, environmental and regulatory proceedings, and we have estimated the probable cost for the resolution of these proceedings. These estimates are based on an analysis of potential results, assuming a combination of litigation and settlement strategies. It is possible that our future consolidated financial results could be materially affected by changes in our assumptions. See Notes 4, 14 and 16 of the Notes to Consolidated Financial Statements, “Rate Matters and Regulations,” “Commitments and Contingencies” and “Legal Proceedings,” respectively, for additional information. Retail: Sales of electricity to residential, commercial and industrial customers. Classification of customers as residential, commercial or industrial requires judgment and our classifications may be different from other companies. Assignment of tariffs is not dependent on classification. Other retail sales of electricity include lighting for public streets and highways, net of revenue subject to refund. Wholesale: Sales of electricity to electric cooperatives, municipalities, other electric utilities and RTOs, the prices for which are either based on cost or prevailing market prices as prescribed by FERC authority. Revenues from these sales are either included in the retail energy cost adjustment or used in the determinations of base rates at the time of our next general rate review. Other: Miscellaneous electric revenues including ancillary service revenues and rent from electric property leased to others. This category also includes transactions unrelated to the production of our generating assets and fees we earn for services that we provide for third parties. Electric utility revenues are impacted by things such as rate regulation, fuel costs, technology, customer behavior, the economy and competitive forces. Changing weather also affects the amount of electricity our customers use as electricity sales are seasonal. As a summer peaking utility, the third quarter typically accounts for our greatest electricity sales. Hot summer temperatures and cold winter temperatures prompt more demand, especially among residential and commercial customers, and to a lesser extent, industrial customers. Mild weather reduces customer demand. Our wholesale revenues are impacted by, among other factors, demand, cost and availability of fuel and purchased power, price volatility, available generation capacity, transmission availability and weather. Below we discuss our operating results for the year ended December 31, 2017, compared to the results for the year ended December 31, 2016. Significant changes in results of operations shown in the table immediately below are further explained in the descriptions that follow. BASIC EARNINGS PER AVERAGE COMMON SHARE OUTSTANDING ATTRIBUTABLE TO WESTAR ENERGY, INC. DILUTED EARNINGS PER AVERAGE COMMON SHARE OUTSTANDING ATTRIBUTABLE TO WESTAR ENERGY, INC.
Fuel and purchased power costs fluctuate with electricity sales and unit costs. As permitted by regulators, we adjust our retail prices to reflect changes in the costs of fuel and purchased power. Fuel and purchased power costs for wholesale customers are recovered at prevailing market prices or based on a predetermined formula with a price adjustment approved by FERC. As a result, changes in fuel and purchased power costs are offset in revenues with minimal impact on net income. In addition, SPP network transmission costs fluctuate due primarily to investments by us and other members of the SPP for upgrades to the transmission grid within the SPP RTO. As with fuel and purchased power costs, changes in SPP network transmission costs are mostly reflected in the prices we charge customers with minimal impact on net income. For these reasons, we believe gross margin is useful for understanding and analyzing changes in our operating performance from one period to the next. We calculate gross margin, a non-GAAP measure, as total revenues, including transmission revenues, less the sum of fuel and purchased power costs and amounts billed by the SPP for network transmission costs. Accordingly, gross margin reflects transmission revenues and costs on a net basis. The following table summarizes our gross margin for the years ended December 31, 2017 and 2016. The following table reflects changes in electricity sales for the years ended December 31, 2017 and 2016. No electricity sales are shown for transmission or other as they are not directly related to the amount of electricity we sell. Gross margin decreased due primarily to lower retail sales. The lower retail sales were attributable primarily to more mild weather, which particularly impacts residential and commercial customers. There were approximately 13% fewer cooling degree days compared to 2016. Partially offsetting the impact of less favorable weather in 2017 was improved sales to industrial customers due partially to a few of our larger, lower margin chemical and oil customers who experienced improved global demand for their products as well as improved sales to the construction segment. Income from operations, which is calculated and presented in accordance with GAAP in our consolidated statements of income, is the most directly comparable measure to our presentation of gross margin. Our presentation of gross margin should not be considered in isolation or as a substitute for income from operations. Additionally, our presentation of gross margin may not be comparable to similarly titled measures reported by other companies. The following table reconciles income from operations with gross margin for the years ended December 31, 2017 and 2016.
partially offsetting these decreases was an $8.8 million increase in operating and maintenance costs due to the start of operation of our Western Plains Wind Farm in March 2017. Depreciation and amortization expense increased due primarily to the start of Western Plains Wind Farm in March 2017.
a decrease of $1.2 million in meter reading expenses due primarily to implementing the use of smart meters. Taxes other than income tax decreased due primarily to a $24.2 million decrease in property tax expense. This decrease was due to a decrease in amortization of the regulatory asset comprised of actual costs incurred for property taxes in the prior year in excess of amounts collected in our prices in the prior year. This decrease is mostly offset in retail revenues. Other income decreased due to our having recorded $19.5 million less in COLI benefits and a decrease in equity AFUDC of $9.6 million. Partially offsetting these decreases was an increase of $3.5 million related to the deconsolidation of the trust holding our 8% interest in JEC. Interest expense increased due primarily to an increase in interest expense on long-term debt of $4.9 million as a result of the issuance of first mortgage bonds (FMBs) in excess of retirements and a $4.4 million decrease in debt AFUDC. partially offsetting these decreases was an increase of approximately $12.2 million in income tax due to expensing excess net deferred income tax assets associated with the TCJA. Below we discuss our operating results for the year ended December 31, 2016, compared to the results for the year ended December 31, 2015. Significant changes in results of operations shown in the table immediately below are further explained in the descriptions that follow.